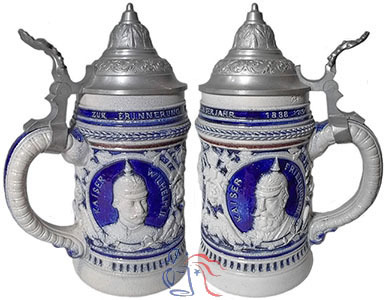 Stein depicts Wilhelm I (1797-1888), Friedrich III (1831-1888) and Wilhelm II (1859-1941), the three emperors who reigned over the German empire from 1871 through the end of World War I. Following the death of Emperor Wilhelm I in 1888, Friedrich III was crowned Emperor but reigned for only ninety-nine days due to cancer of the larynx. He was succeeded that same year by his son, Wilhelm II.